Runners need an efficient gait to stay injury free and perform at their best. A relatively minor imbalance of joint motion is enough to cause a big problem after thousands of footfalls. On the other hand, the same problem may be completely irrelevant for someone who only plods from the couch to the refrigerator. That’s why so many people develop “running injuries” after starting a new program. There are several self checks that every athlete should use to periodically audit and their joint motion balance before developing an injury. I’ll discuss them in a series of posts. Ankle mobility. To be able to properly perform any standard of athletic movement (eg. 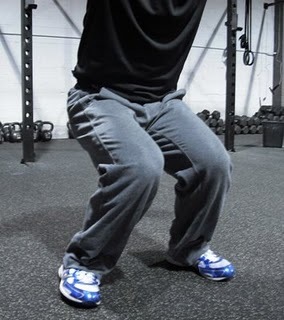 squat, lunge, Turkish get-up) a certain amount of ankle motion should occur. 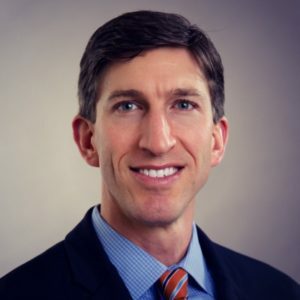 Dr. Greg Rose at the Titleist Performance Institute suggests having 4″ of travel of the knee over the 2nd toe. 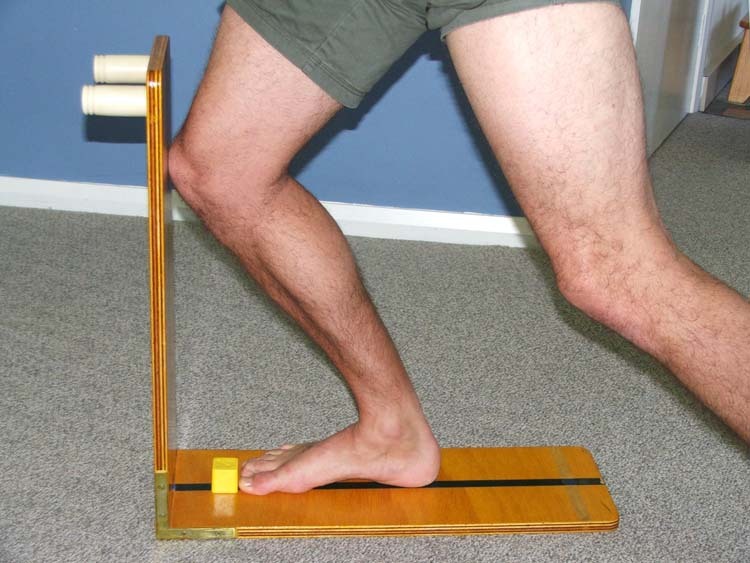 This 4″ standard for ankle dorsiflexion is easy to measure and consistent with what we know about biomechanics. See, no foot pronation and the knee doesn’t dive inward. You can audit this with your toes 4″ from a wall and lunging the knee toward the wall and directly over the 2nd toe. Bad compensations include foot flattening/ rolling in and the knee arching inward. Knee’s in, foot’s out, arch’s flat. All bad things in life and sport. If you don’t have 4″, then you need to get it. Stretch the calves and mobilize the ankle. Once you get the 4″, perform a movement audit as a warm-up before training(eg. squat, lunge, Turkish get-up). Mobilize the ankle as demonstrated in the pictures below. What other techniques are helpful for ankle mobility problems? Start position. The stick, held straight up and down, provides a target with the knee to the outside of the stick. The ending position. Slowly oscillate back and forth every several seconds. 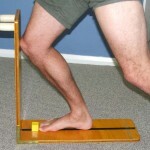 What would the wooden device that allows you to measure dorsiflexion called? The wooden stick is simply a vertical target 6 inches from the foot. You could use a doorway or anything else that can serve as s target for the knee 6 inches in front and directly in line with the second toe. Great question! Thanks. I’m glad you liked it. I plan to regularly post more self care information.